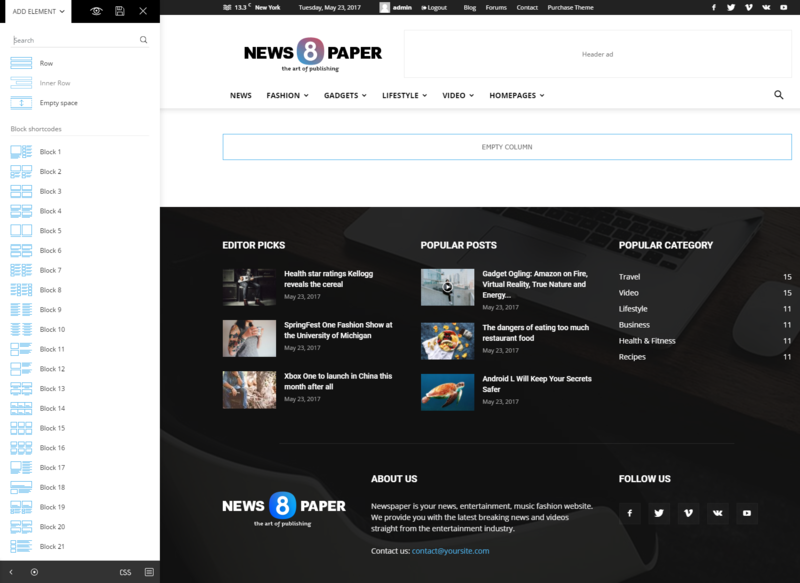 The tagDiv Composer will automatically be activated when updating to Newspaper 8 or installing the theme for the first time. Please do not use both the tagDiv Composer and WPBakery page builder simultaneously on the same page. Please do not edit a page originally created with WPBakery or other page builders. To transition between the 2 builders please use this guide. 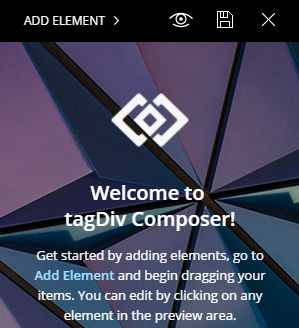 When you create pages with our theme it’s required to use our custom-made page builder called the tagDiv Composer. This handcrafted page builder comes with a drag and drop functionality. 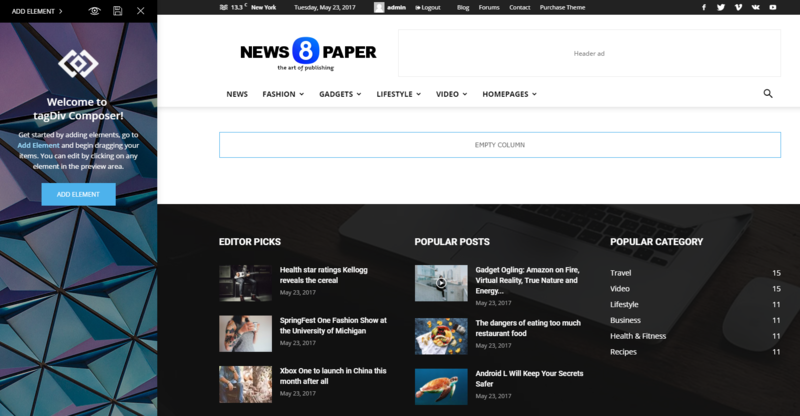 This builder is a powerful tool specially crafted to help you style your pages using custom made content blocks and grids. The tagDiv Composer can only be used on pages and only on the front-end of your website. You will see a front-end preview of your page and the tagDiv Composer on the left of the screen. In this welcome screen, you can see two additional options apart from the page builder functionality. They let you choose the page template and the header style you want. Let’s start with the Add Element button. This is the place to start customizing your page and adding content to it. Press the button, and the dropdown list will appear with all of the elements you can add to the homepage. You can drag and drop each and every one of these elements to create the layout you desire. However, you must first start with a row as the Composer works with rows and columns. You can add a row simply by dragging the row icon in the empty space on the page. Once drag into the page, if you click the element, a settings panel will open on the left side of the screen. This functionality applies to every content or structural element, not just rows. The row settings will allow you to select the layout of the row meaning you can have a set number of columns in different styles. Row settings also allow you to add a row ID and an extra CSS class if you want to add custom CSS to affect just the particular row. If you want to delete a row you can grab it from the top left “Row” button. Then, drag it to the bottom right of the screen in the “Drag here to DELETE” box. You can add the different blocks either directly inside a row or inside an inner row if you want to create a more complex structure. Once you add a block to the row/column of your choice, you’ll see it live. This means you can see the actual content live. Changing its settings also changes the live representation of the page making it easier to see what every setting does. Deleting an element is similar to removing a row. Simply drag the element to the bottom right of the screen or just hit the delete icon found on the top right of the block element.